Well, here is a fun idea to transform those veggies into a work of art. 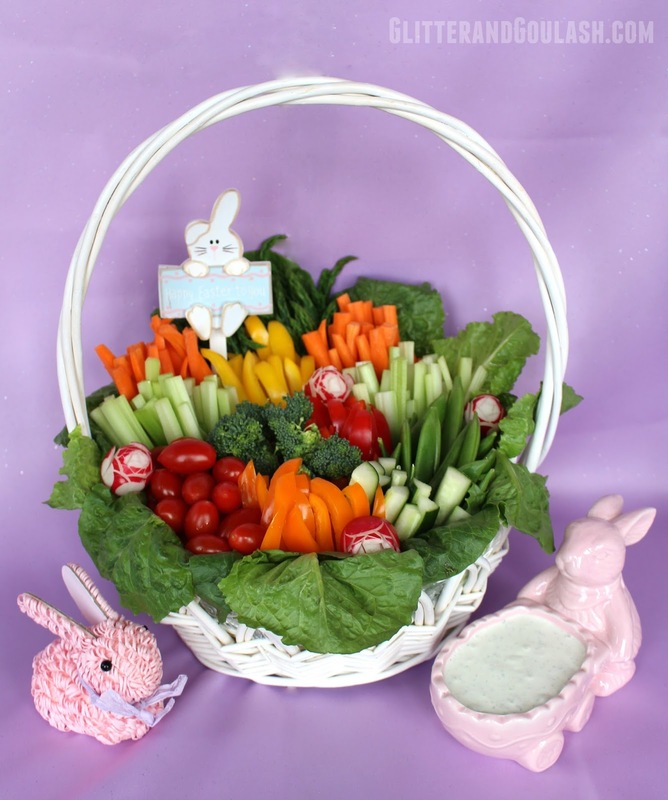 Take those delicious and colorful veggies, get rid of the tray, and add a basket. Easy and beautiful! 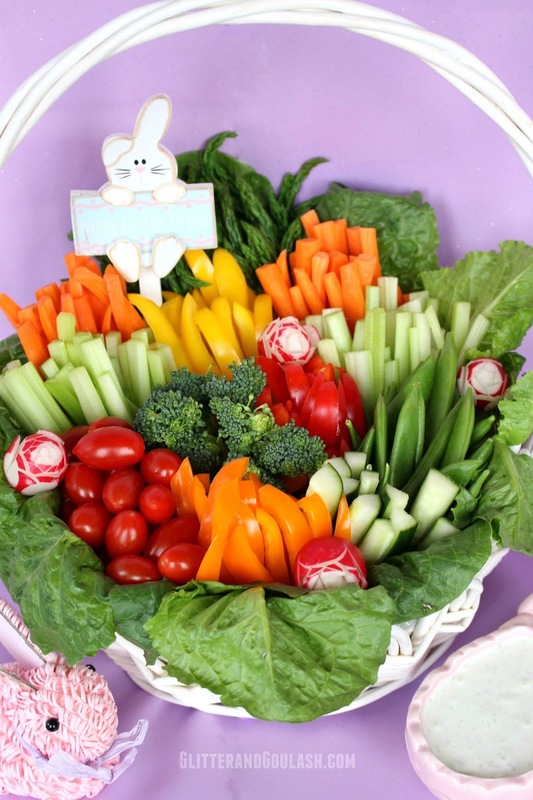 Also, check out my Easter Egg Relish Tray for another fun display idea! 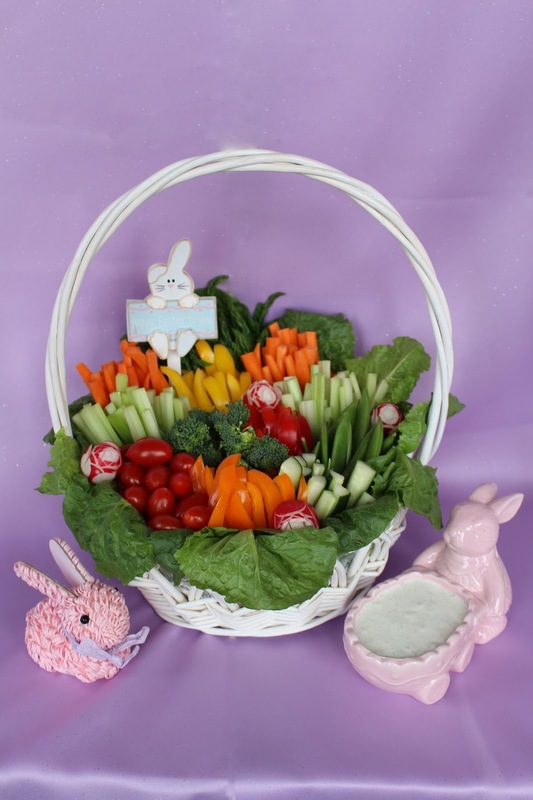 The only extra item that you will need for this display, besides your vegetables, is an Easter basket. You can use any basket you may have around the house, however I like to use a white one as I think it really makes the colors of the vegetables pop. 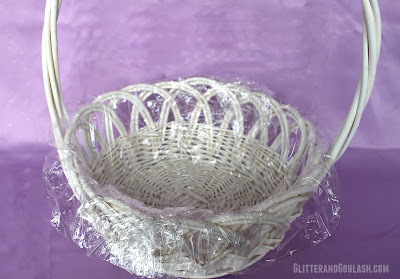 The first thing that you want to do is line your basket with some cellophane. This will protect your food from any bamboo splinters or particles that may break off of the basket material. Next, you will need any type of green leafy lettuce. 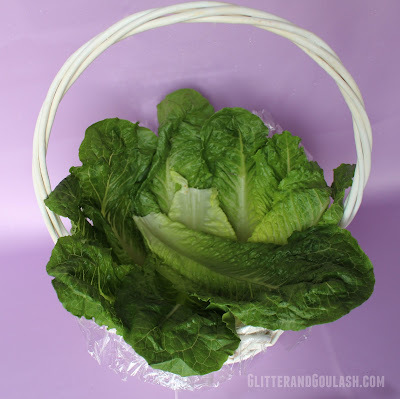 Regular green leaf lettuce is my first choice for this application, but I used romaine lettuce leafs for this basket as they looked the freshest that particular day at the store. You will want to start layering your lettuce leafs until they cover the entire perimeter of your basket. Make sure that the tips of your leaves are at least 4-5 inches above the rim of your basket. 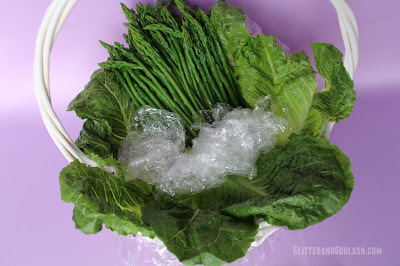 This may seem high, but once you start adding your vegetables, it pulls the leaves down. 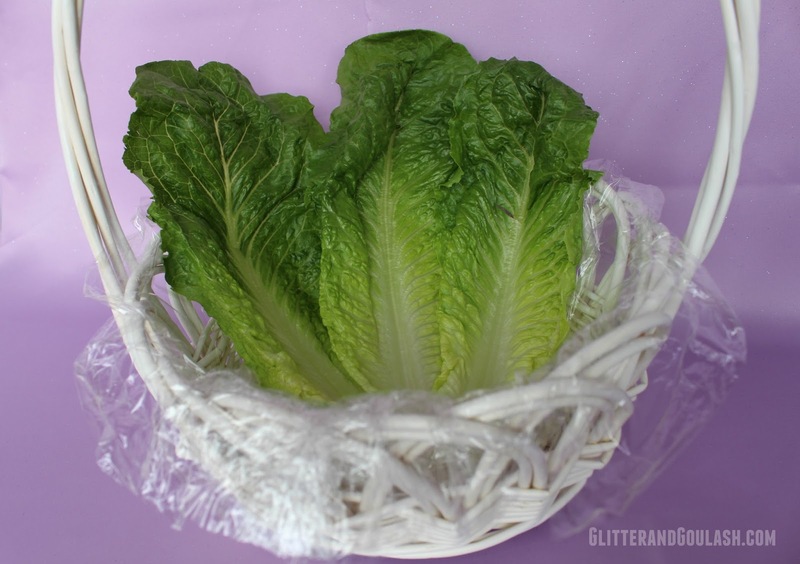 Placing the lettuce leaves as a base will cover all of your cellophane and also give us a nice canvas for your colorful veggies. 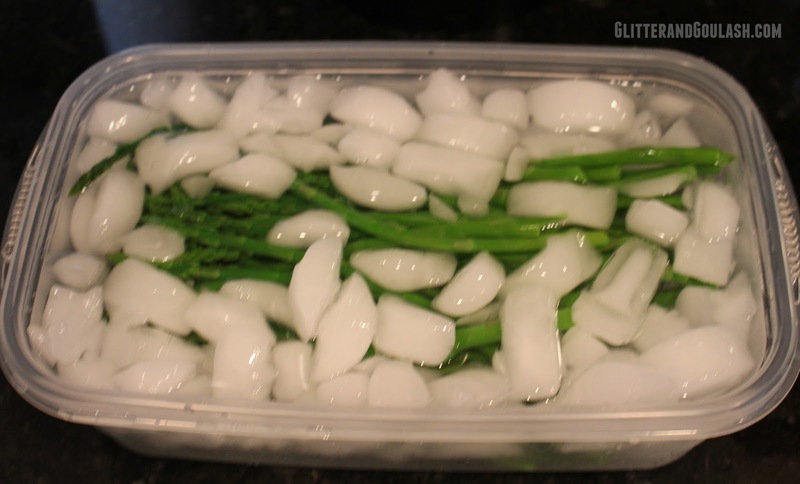 Starting with taller items, such as blanched asparagus (see directions below), start placing your vegetables in the back of your basket working forward. If there is a significant height difference with some of the vegetables, I will ball up some cellophane and place under them to help you achieve a uniform height with all of your vegetables. Continue layering all of your vegetables, keeping in mind that you want contrast. Try to putting different colored and textured items together for most visual appeal. Extra Tip: Serving blanched asparagus is a fun new thing to add to any relish tray/basket. Blanching is a fancy word for “partially cooking”. It is a simple process that minimally cooks your asparagus, but since we are not cooking it completely, it will maintain its crunch. 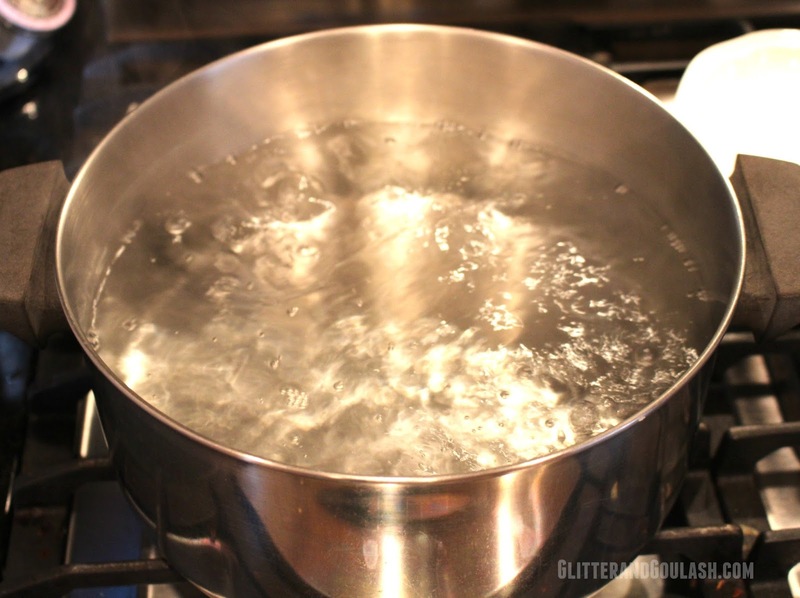 Bring a pot of water to a hard boil. Add your asparagus and boil for 3-4 minutes, depending on thickness. Remove your asparagus from the boiling water and immediately add to an ice bath (container with ice and cold water) and let sit until completely cooled. Remove from ice bath and lay on some paper towels to dry. I’m definitely taking this to Easter family dinner. SUPER cute!! Will definitely be using this idea, as well. Thank you for sharing. Glad you liked it Cori! It is fun to make and some how the kids like veggies more when it is in a fun presentation. What a great idea! I love it. Thank you! Glad you like it! Happy Easter!